“THREE KEYS – home, office, villa” is the biggest specialised expo for construction and furniture, taking place outside the capital city. 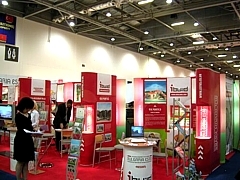 The Expo stands out as a place for contacts and as an undisputed stimulus for the development of design, restructuring, architecture, construction and furnishing. The Expo presents: design, survey, architecture, restructuring and refurbishing, construction, construction materials: panels, steel structures, wood, plumbing and sewer installations, electrical installations, suspended ceilings, construction cladding, PVC and Al framework, glues, paints, etc. ; construction equipment and mechanisation; interior, furniture: items of furniture, bed covers, floorings, faience, terracotta, parquet, armoured doors, security roll blinds, wall-panelling, cornices and decorative elements; heating: fire-places, air-conditioning installations, boilers, radiators, heating installations, heat insulations, pumps, automation; lighting: lighting pieces, systems, non-standard lighting; garden equipment and accessories.